The P569-016-CL3 High-Speed HDMI Cable (M/M) is ideal for home theater systems, digital signage and other applications that display Ultra High Resolution (UHD) video and multi-channel audio. It connects an HDMI-enabled source device, such as a Blu-ray™ player, video game system or computer, to a 4K-enabled television, monitor or projector. The P569-016-CL3 carries a CL3 rating, making it suitable for in-wall installation. It supports UHD video resolutions up to 3840 x 2160 (4K x 2K), data transfer speeds up to 18 Gbps and 3D. Backward compatible with previous HDMI generations, the P569-016-CL3 works in all HDMI cabling scenarios. 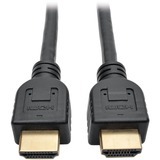 This latest generation HDMI cable supports Ethernet data connectivity, which allows web-capable devices with HDMI 1.4 connectors to share their internet connection with other connected HDMI devices. An audio return channel simplifies setups between displays and A/V receivers. When used with an Apple® digital A/V adapter, it supports iPad2® video mirroring for playing games, watching videos or displaying presentations. The 16-foot molded 30 AWG cable features premium foil and braid shielding to deliver top-of-the-line signal quality and protection from EMI/RFI interference. Gold-plated connectors ensure excellent conductivity. Integral strain relief ensures the cable and connectors last a long time. A flexible CL3-rated PVC jacket makes the cable easy to install in tight spaces.